I love Takeru in the city. For a change, I thought I would give the Chatswood outlet of Takeru a go. 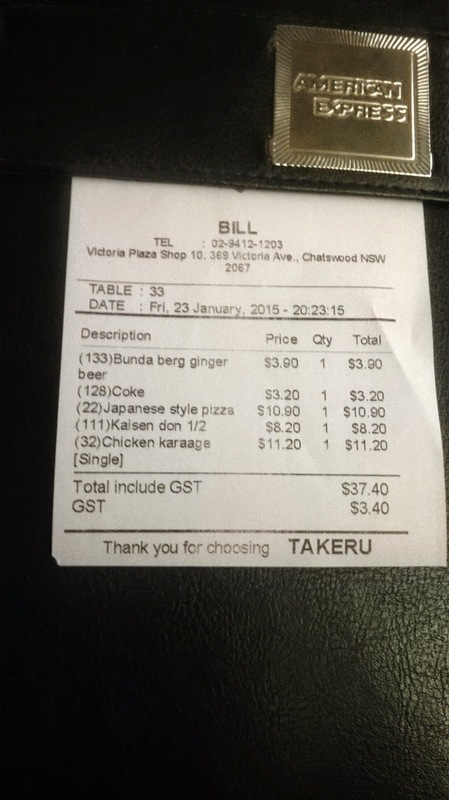 The 71% like rate on urbanspoon for Chatswood v.s the 86% like rate on the City Takeru is probably a fair comparison. The Chatswood was good but not quite as well put together as the city version. I love ordering off the touch screens to the side of each table. My normal favourite Kaisen Don (half version is $8.20 below) was a nice mesh of fresh sashimi of Tuna, Salmon and Kingfish on a bed of rice but it was not the tasty concoction that I am used to. 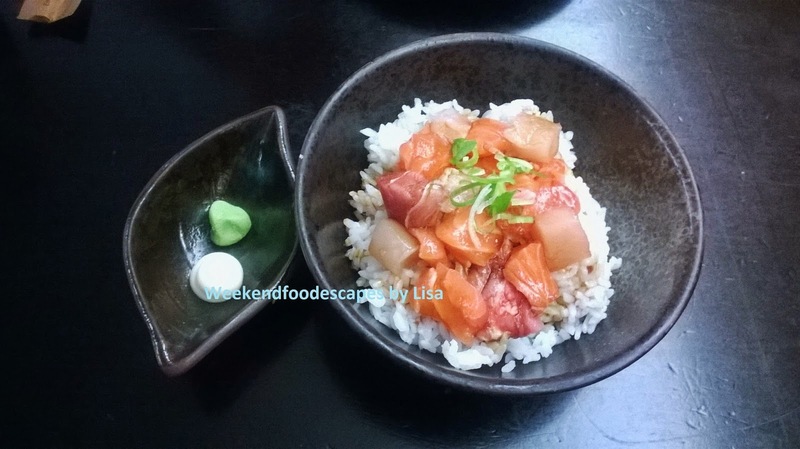 The ratio of rice, sashimi, wasabi, mayonnaise and soy was not to my usual preference like there is in the city. It's still a nice dish to order. The Japanese Fried Chicken (above, $11.20) was crispy and cooked well. I love Karaage chicken with the mayonnaise. You will get about 4-5 decent sized chicken pieces. 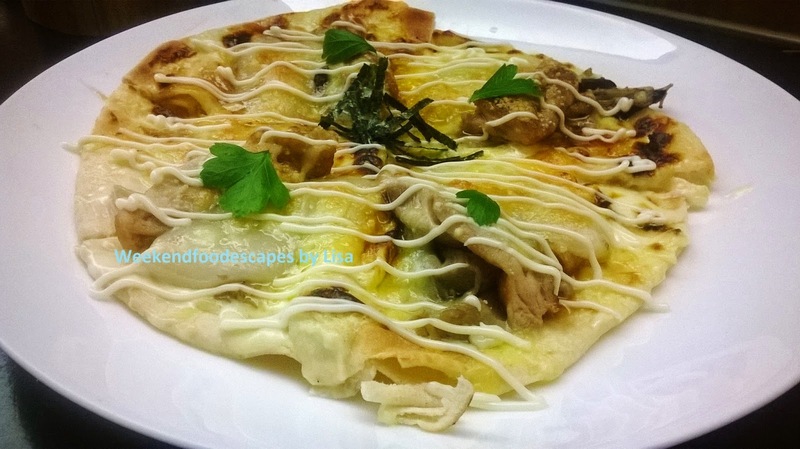 My regular favourite dish at Takeru in the city is the Japanese Pizza (below, $10.90) and while it was super tasty, I missed the regular textures and consistency of the pizza in the city. The Japanese Pizza has chicken, flour dumpling topped with mayonnaise and if you like.. some tabasco to cut through all the cheesy flavours. 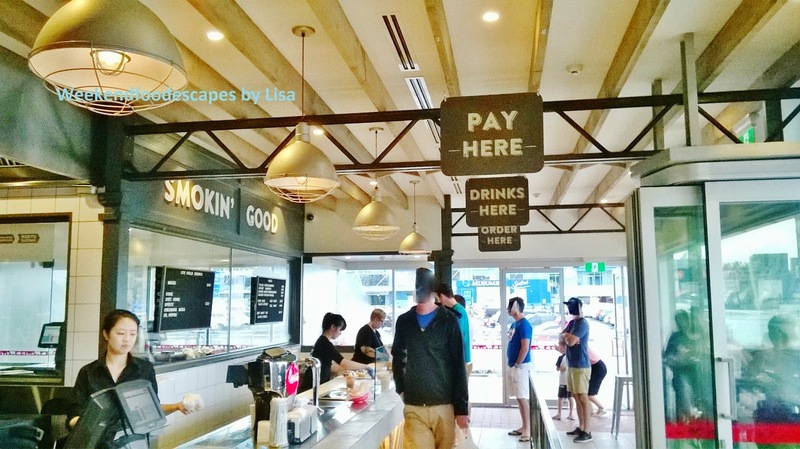 Location: Right near Chatswood Chase, walk inside the arcade at 369 Victoria Ave, Chatswood. 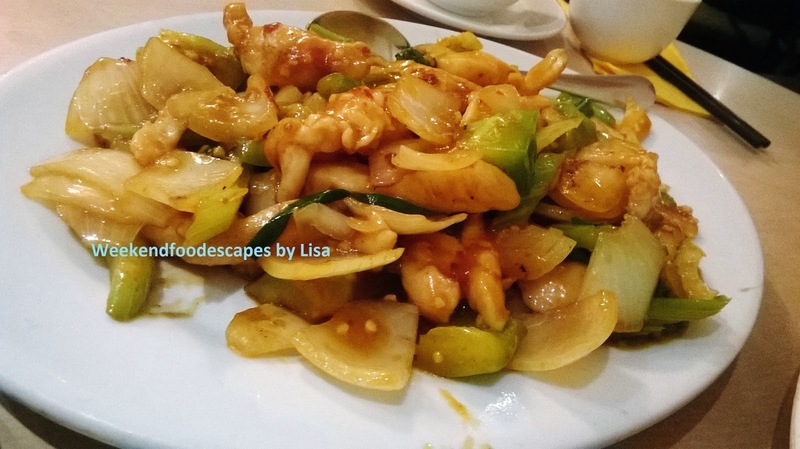 There seems to be a tonne of Chinese eateries in Kingsford. A friend of mine suggested the Delicious Chinese Cuisine because its cheap, cheerful and kinda greasy. It's 92% like rate is too generous. Sometimes you just want a bit of greasy Chinese but I think there would be better competition. Most dishes are about $10-$14ish so they are very reasonably priced though. I shared the stir fried chicken (above) which had large chunks of onion and capsicum. It was average to be honest but I was hungry and not too fussed at the time. 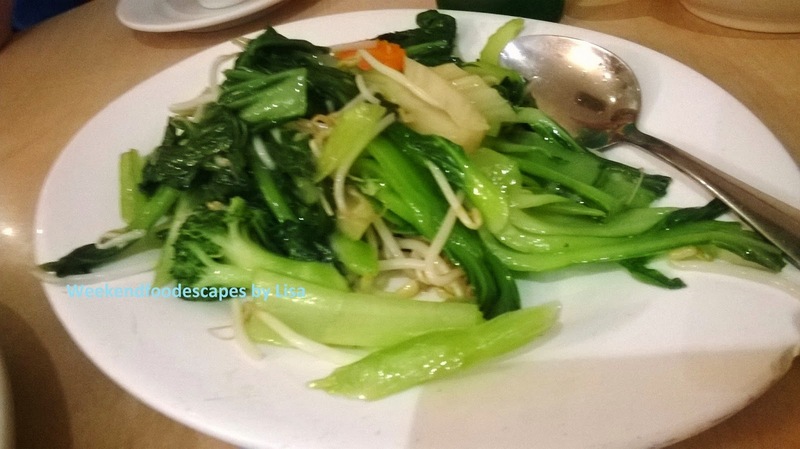 The green vegetables (below) with a generous portion of bean sprouts were also very chunky in parts. 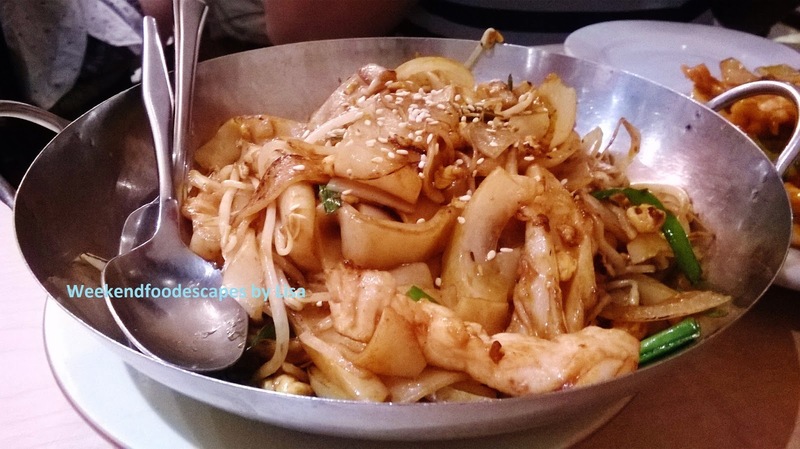 I was craving the chow kueh teow (below) and thought of the delicious version at Sedap but was disappointed with the barely sauced rice noodles. Again, I guess it didn't matter when I was super hungry. 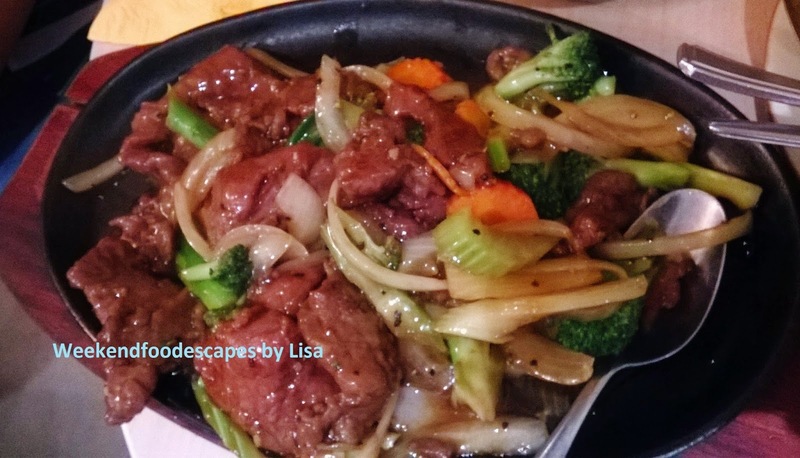 The peppered beef (below) was nice and tender but glazed in a thick syrupy texture. It was still devoured. Overall, a reasonably priced meal but average quality in food and atmosphere. Parlour Burger has a great location. It's burgers however are unfortunately mediocre. This is backed up by the 45% like rate on urbanspoon. Unfortunately McDonald's has closed down nearby but if it was still open, I'd prefer the Maccas burger. You can always walk to Circular Quay Maccas though! I am not convinced by their main fare of the burger. I tried the Chicken Quiona Burger with caesar dressing, above ($10). It was average and slightly dry. I prefer the Mc Chicken Burger for sure. 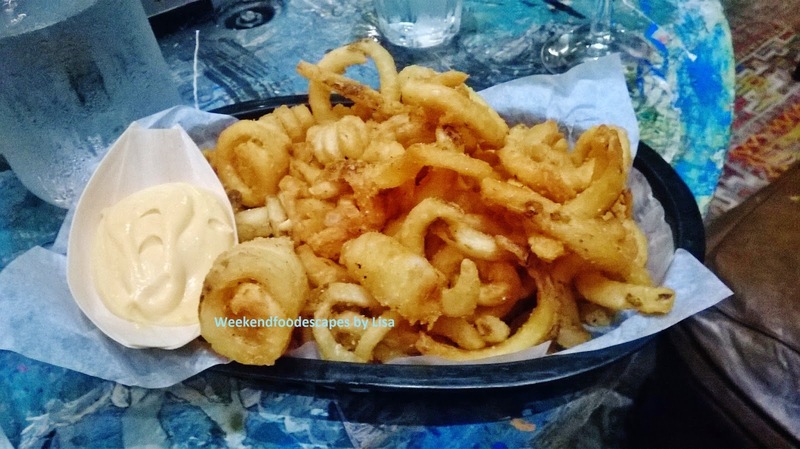 The Beer Battered Onion Rings were not bad. 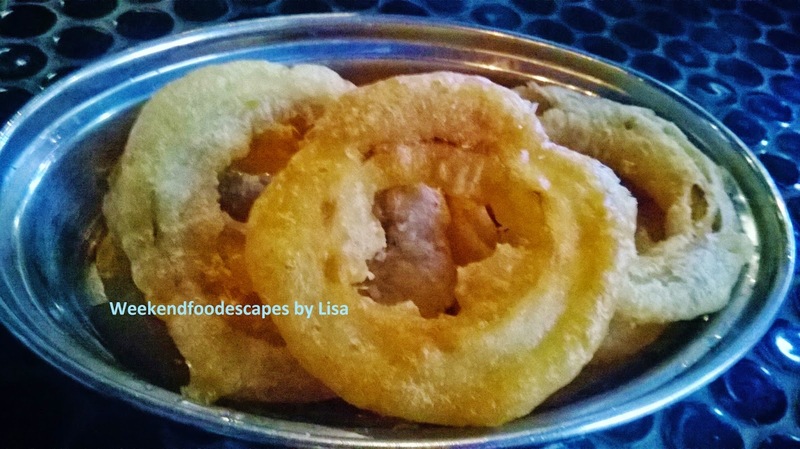 They were crispy, big rings that weren't too oily. 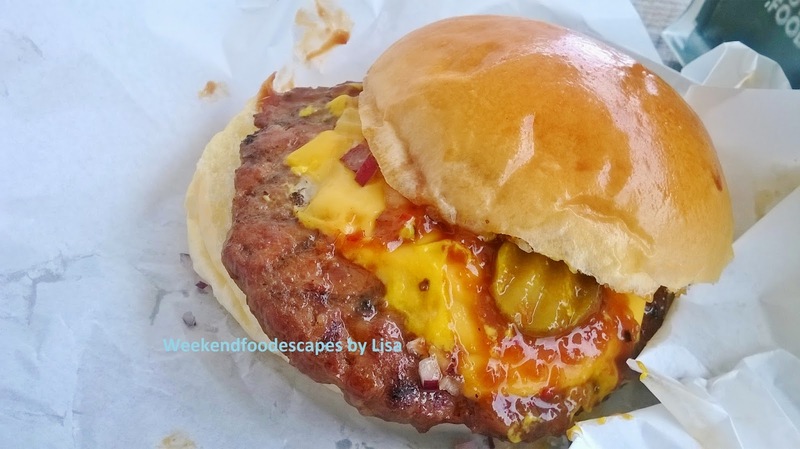 The original morrison burger with chipotle mayo (below, $10) was also average. The meat was also slightly dry. The Duck Fat Chips were $6 and were average. Give this one a miss folks! 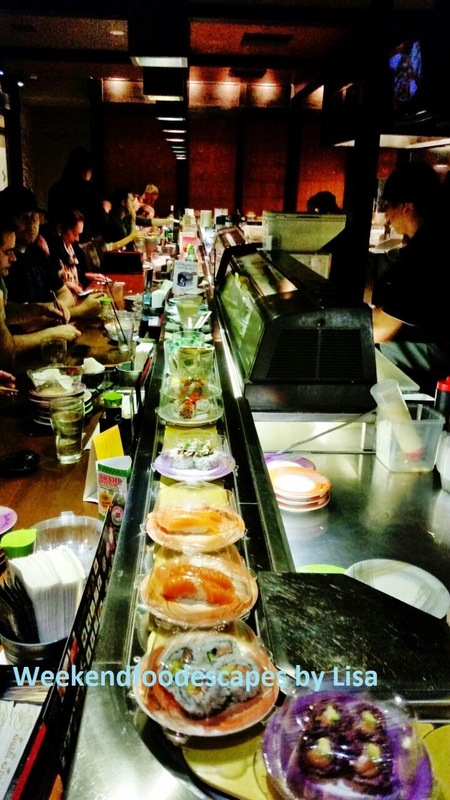 Sushi Train in Neutral Bay is special and differentiates itself from the rest of the Sushi Train franchise. The difference is the upmarket decore and ambiance with jazz music in the background. More importantly, you can purchase alcohol along with special dishes that you can only purchase at Neutral Bay. Some of the unique dishes that you can only get include the duck nigiri, chicken volcano nigiri and prawn miso garlic miso rolls. All the dishes are reasonably priced. Here are some of my favourites. 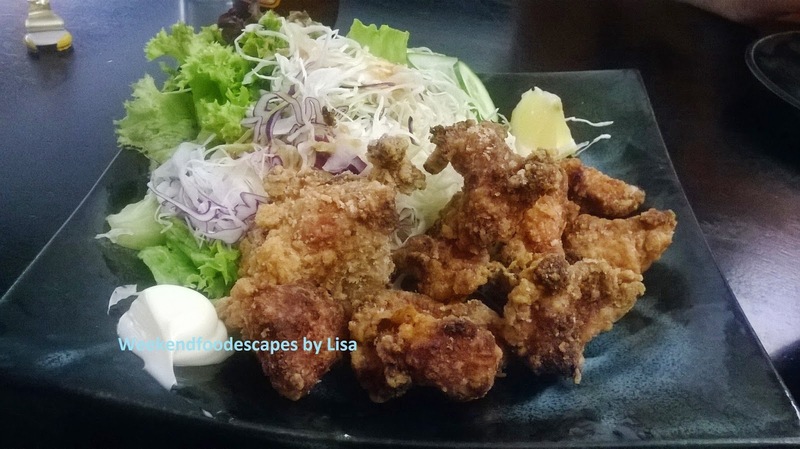 I quite enjoyed the freshly cooked Karage chicken ($5 on the purple plates) that I ordered below. 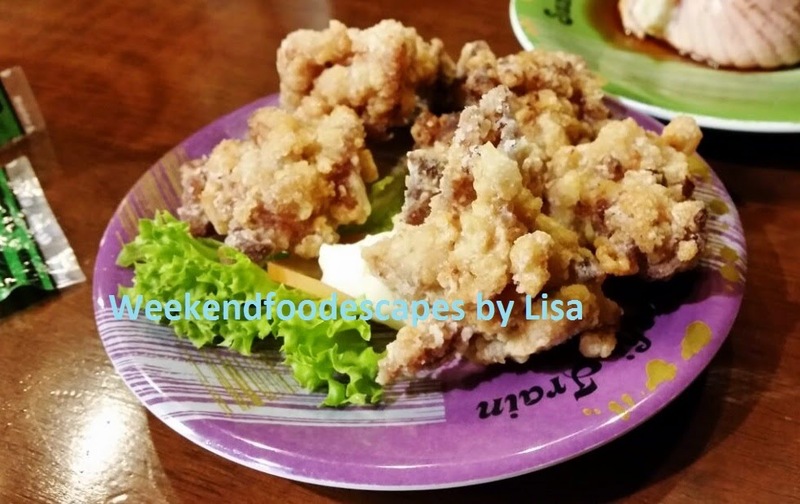 Japanese Fried Chicken is delicious when dipped into a generous mound of mayonnaise. Definitely order the chicken. Are you tempted by some sake? These bottles above looked very tempting. You can order 180mls of sake from $7.80-$8.80. For the more thirsty, you can also order the larger sake, 360mls from $12.80-$13.80. I actually went for the Cho-ya Plum wine on the rocks for $7.80. 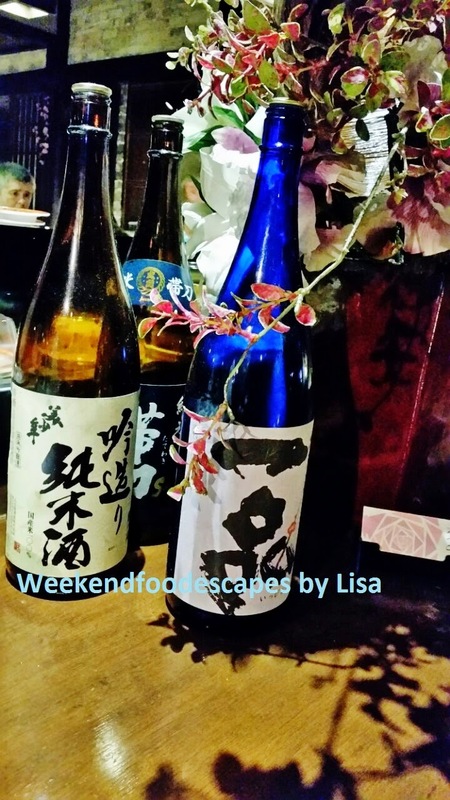 If you are a Washoku Lovers member then you can get a free glass of sake by showing your members card. The Wagyu Beef Salad ($8.80 above) had a generous amount of dressing. 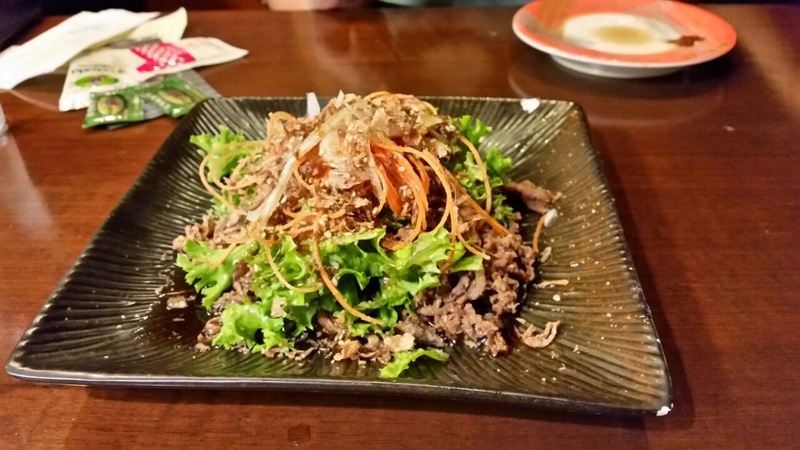 The salad of wagyu beef, lettuce, grated carrot and crunch fried onion bits is a nice side dish to share. My favourite dishes of the night were the volcano chicken (above, $5.50 for green plates). The chicken was warm and juicy with a nice lashing of sauce. Red plates are $4.50 and below. 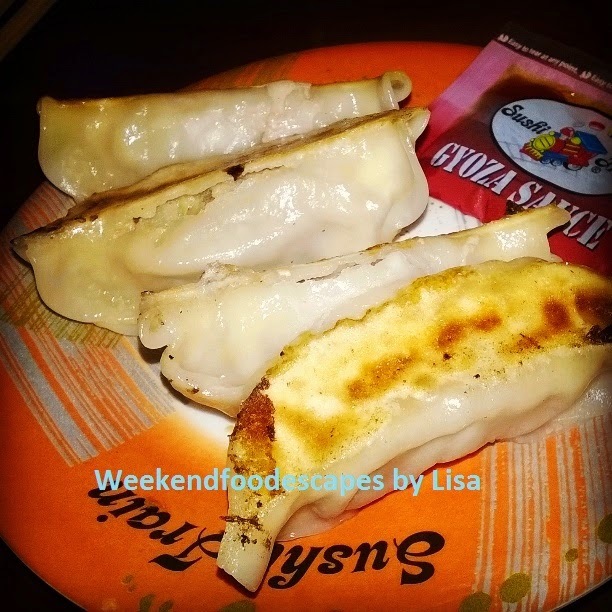 the freshly ordered gyoza was really nice, You can tell the gyoza is authentically Japanese because the skin is thin with a moderately crunchy bottom. Delicious! Definitely order these two dishes. Above is the garlic prawn and miso roll at $4.50 which was something different. Worth a try given you can't get this at any of the other sushi train franchises. Ken is the head chef and owner of the Sushi Train in Netural Bay. 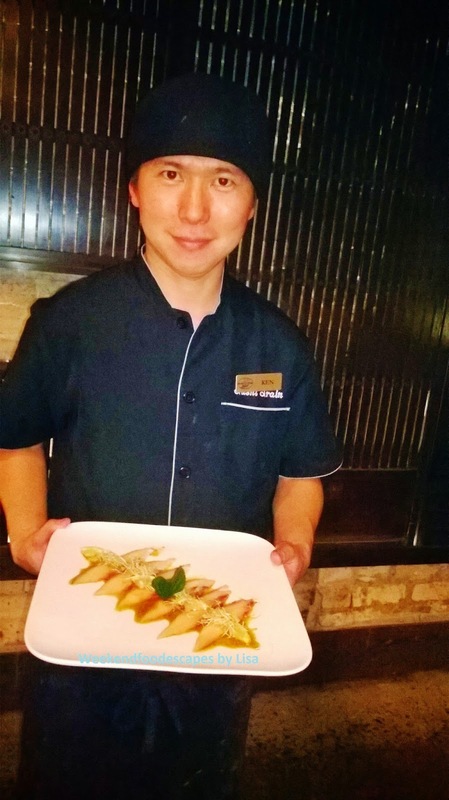 It's been operating in the area for about 5 years and he brings the warmth and friendliness of the Japanese people. Say hello to Ken if you see him, he's such a nice guy! 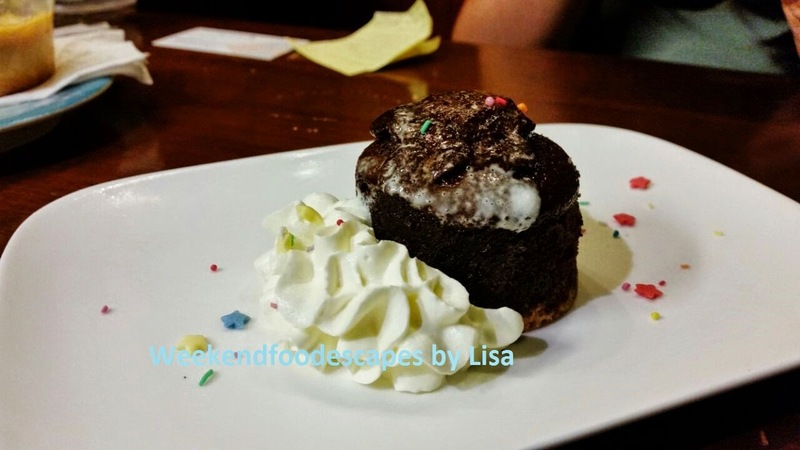 Before you go, I would suggest you sneak in a dessert ($4), the chocolate fondant is a nice treat to finish the meal. So how many plates can you handle? 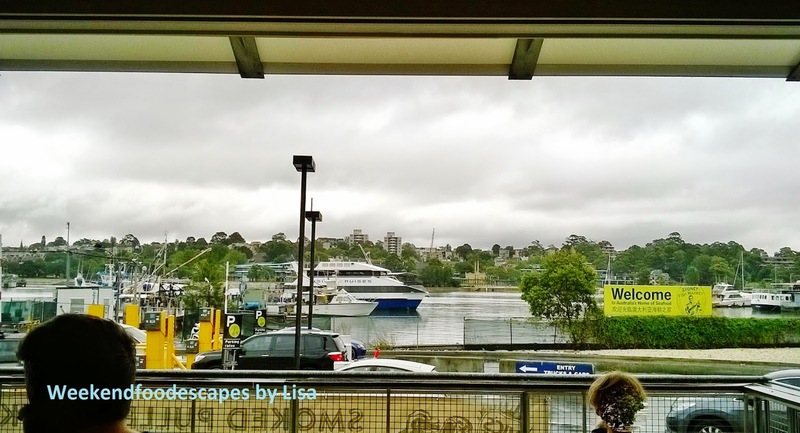 Check out the Sushi Train in Neutral Bay for reasonably priced sushi with the posh decore. 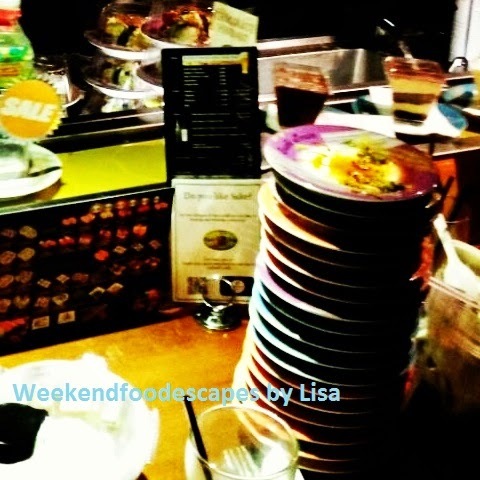 Note: I dined as a guest of Sushi Train and SD Marketing Global. All words and photos are my own. 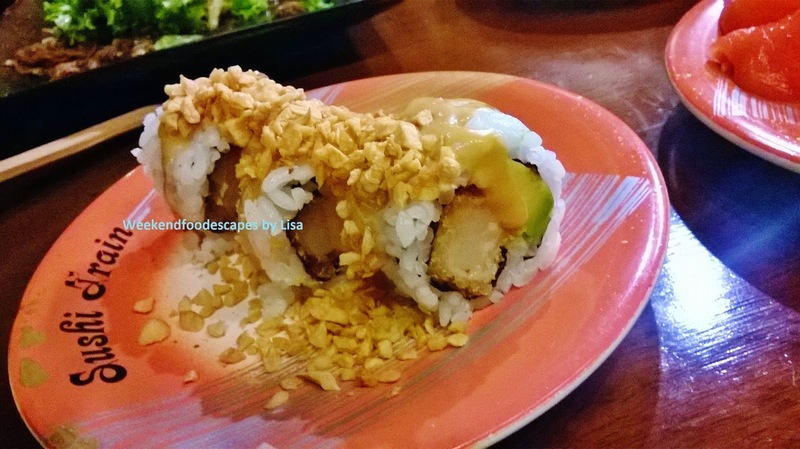 If you hadn't noticed; I go to many Japanese Restaurants so I love trying new places. 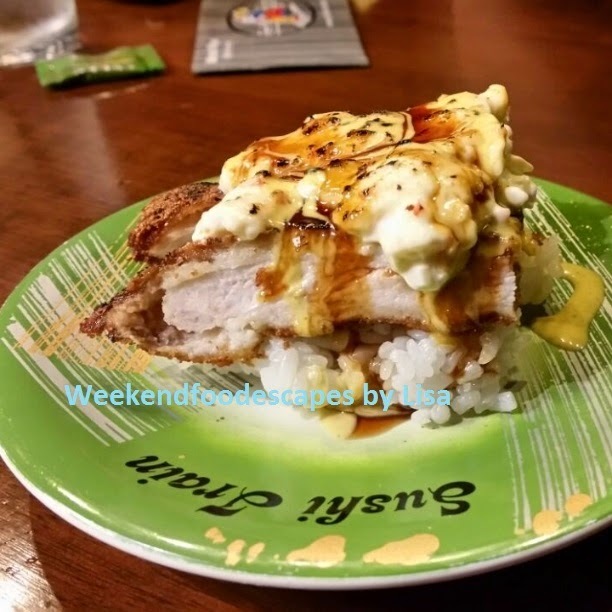 Make sure you join Washoku Lovers for freebies when you dine at the many Japanese Restaurants in Sydney. Work in Progress has the decore similar to a teenage's garage who had been heavily graffiti-ed. I think it took a decade off my mental thinking as I siped on my shiraz. 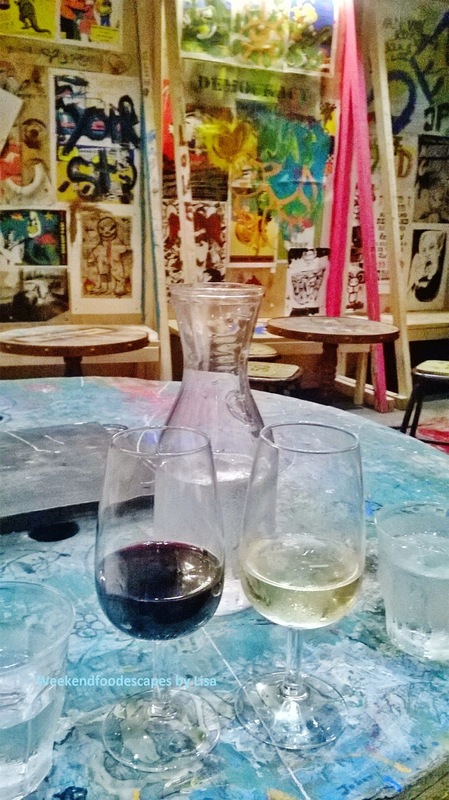 It's actually quite a nice escape from all the other local watering holes in the Sydney CBD. However how long will this bar exist? This is a pop-up bar by Merivale which is still open due to popular demand for now. Watch this space! 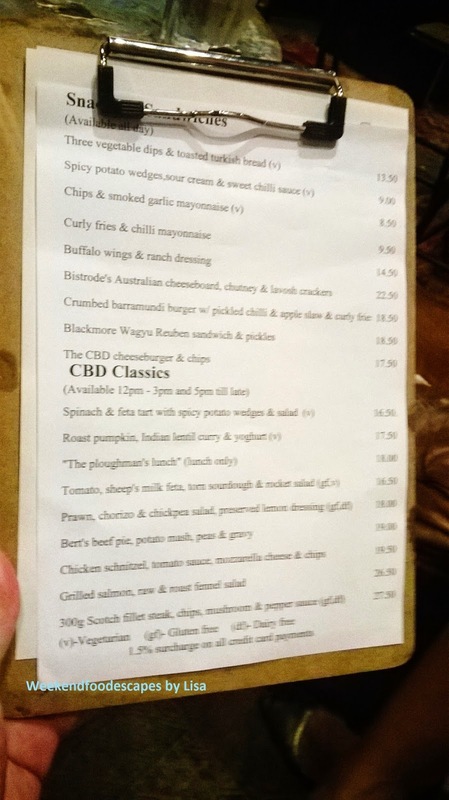 This blog is a few months in delay so the menu seems to have evolved however I believe I just ordered off the bar menu. I need to go back to try more of the menu! I couldn't resist some curly french fries with aioli at $9.50. Salty, crunchy and curly. What more would you need with a few drinks? I also ordered the prawn, chorizo and chickpea salad with preserved lemon dressing ($18ish). 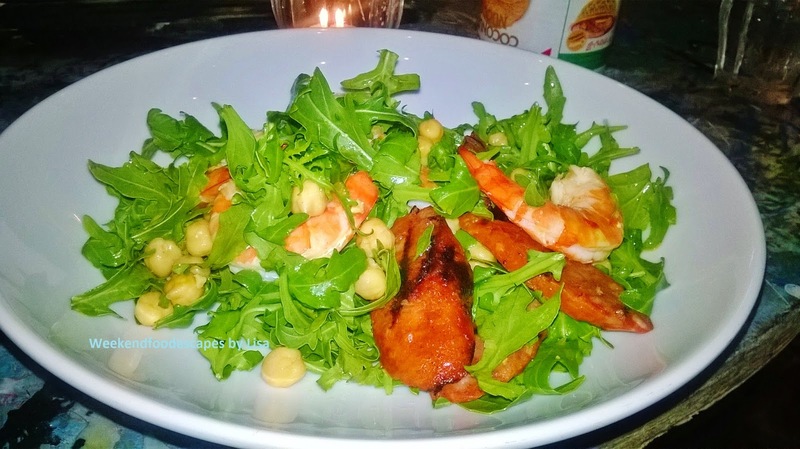 It was a very tasty salad with big king prawns (below). This salad balanced out all the curly fries I ate. So check it out before it's closed down. Opening Hours: The bar is open Monday to Friday, noon to late, with the kitchen taking orders from 12-3pm and 6-10pm. 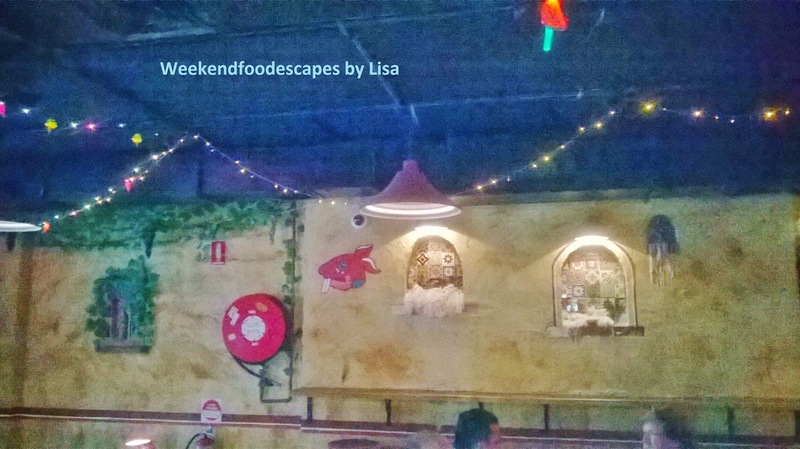 The Bavarian Bier Cafe is a regular venue for social gatherings, birthdays and drink ups. The Bavarian Bier Cafe is particularly popular and known for their big steins of beer. If you're more interested in food; there are delicious options to choose from. 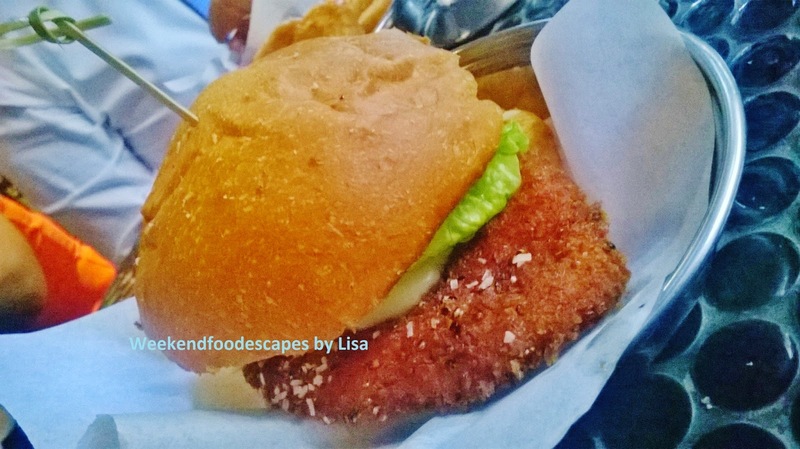 The Bavarian Bier Cafe is known for their schitz. 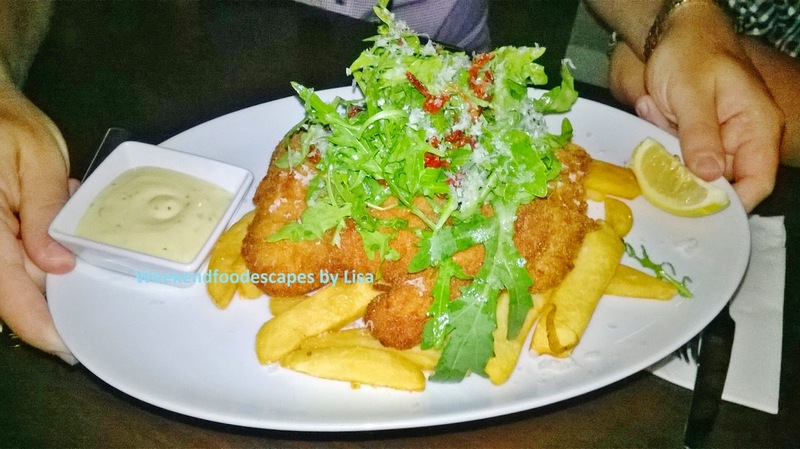 The Uber Schnitzel (above, $27) consists of a pan fried crumbed chicken topped with baby rocket, semi-dried tomato and a dash of parmesan. This Schitz sits on a bed of chips with a side of aioli. 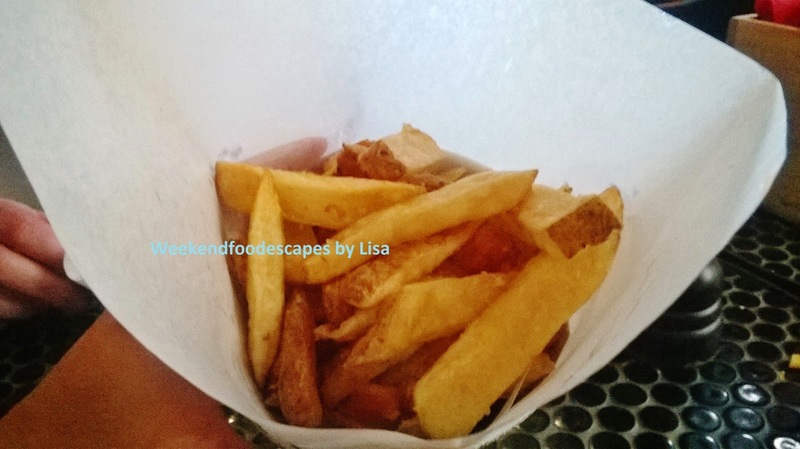 All the components were perfectly cooked and there is a generous serving of chips. This seems to be a very popular choice! For those who are less hungry, I'd definitely recommend the Roasted Pork Roll (below, $14). 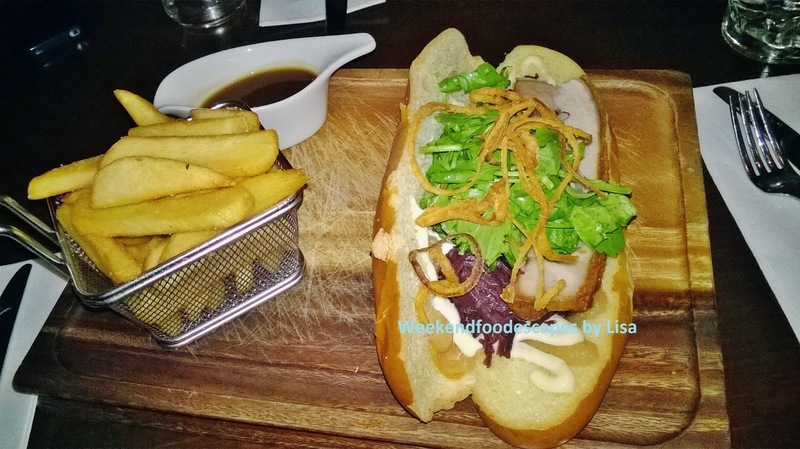 The roasted pork roll is topped with long thin strands of crackling, seasoned with spiced apple, slaw, baby crest with a few squiggles of lime aioli. The pork is warm and homely. The smaller side of chips with a side of gravy. This is still a filling meal but it's not quite as huge as the schnitz type meals. If you're looking for a large portion of meat and less of that salad then the Lowenschitzel might be more to your liking. 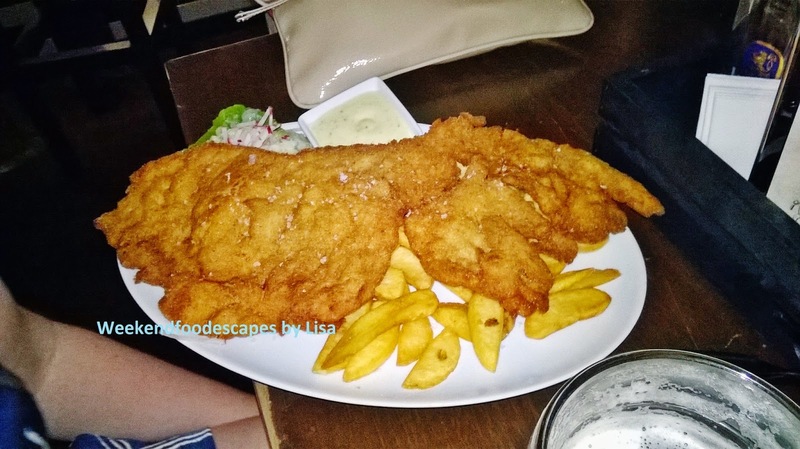 It's basically a giant pork Schnitzel (Below, $29). Meat, Chips and a much smaller portion of salad-type ingredients. 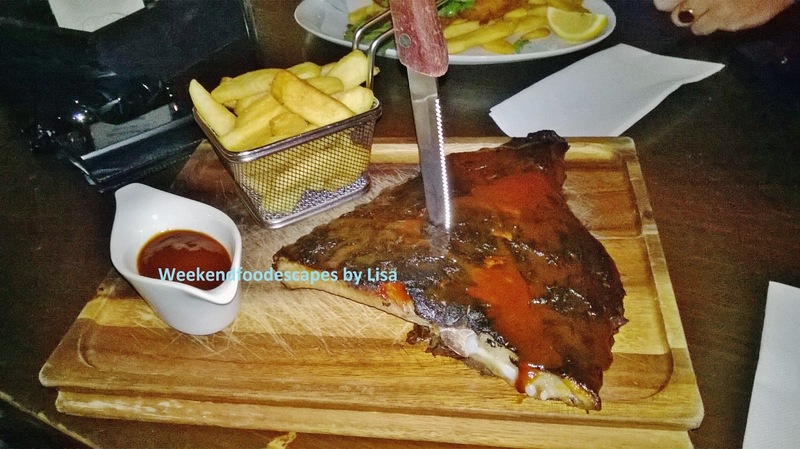 I'd probably recommend avoiding the Meaty BBQ Pork Ribs with chips (Half Rack, $19). They were tasty but go to Hurricanes if you are waiting Ribs! So if you haven't been before, come in for some big steins of Beer.. and enjoy the Schitz or the Pork Roll! It's a beautiful bier hall with good atmosphere. Recommended by a work colleague, I stopped by Tio's for a pre-dinner drink. 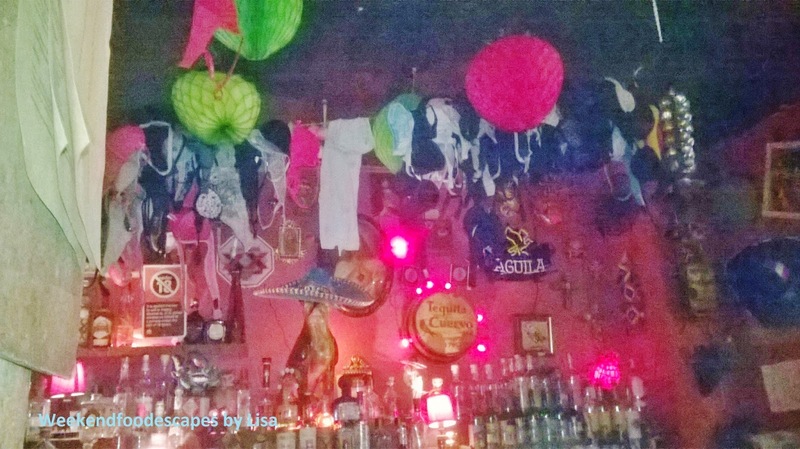 The first thing I noticed was a large array random bras hanging on top of the bar. What a random decoration. 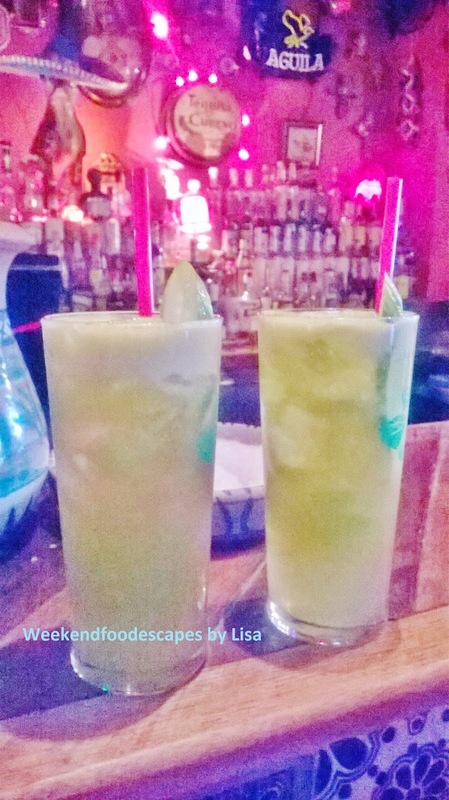 Tio's, is quite dark, dingy but trendy. With a purchase of a drink, they will also offer up a brown paper bag full of ..... popcorn. Another random but delightful surprise. I'd definitely come back for a few drinks. I've walked by before and it's been jam packed so I think it's all about timing. 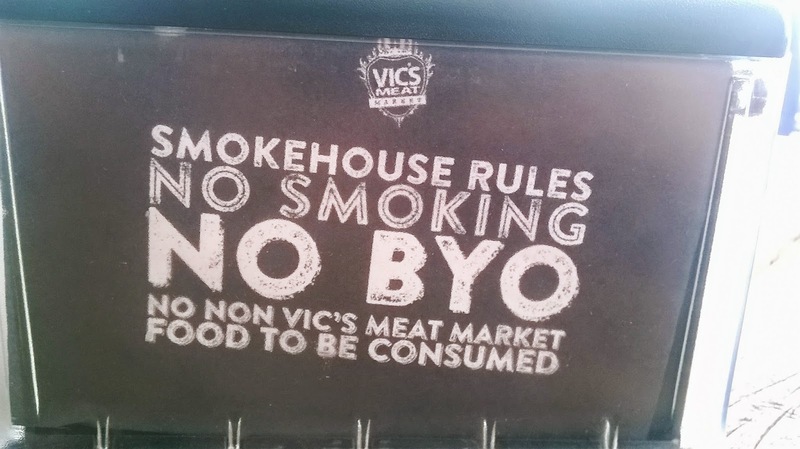 Vic's Meat Market is the place to go if you enjoy BBQ and smokey flavoured meat as an alternative to all the great seafood at the Fish Markets. The eatery is attached to a very up market butchers; ideal for your high grade meats. The eatery however is very reasonably priced. 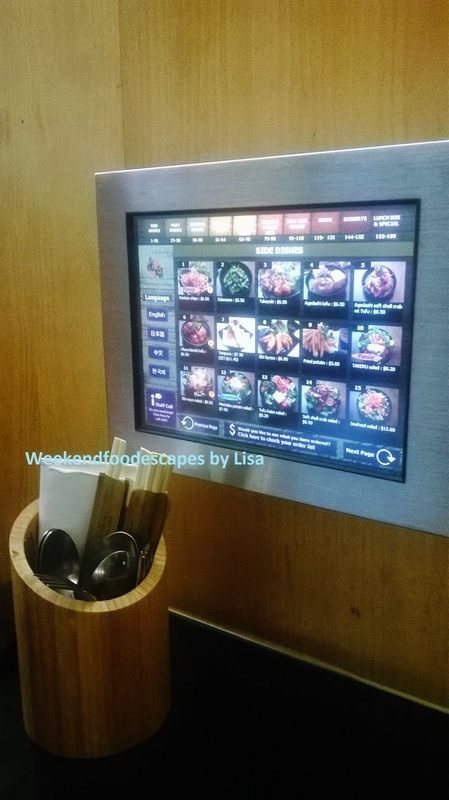 As you walk in and order, you can see the food being prepared as you progress to the cashier. The decore would remind of you of a steak house but by the water (view are above). 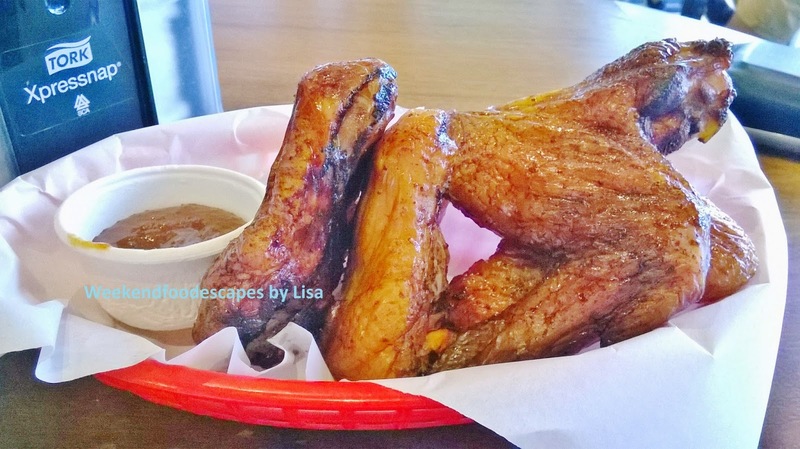 The chicken wings are smokey and well marinated (below). They are perfectly cooked and is an option as a side as no chips are available. 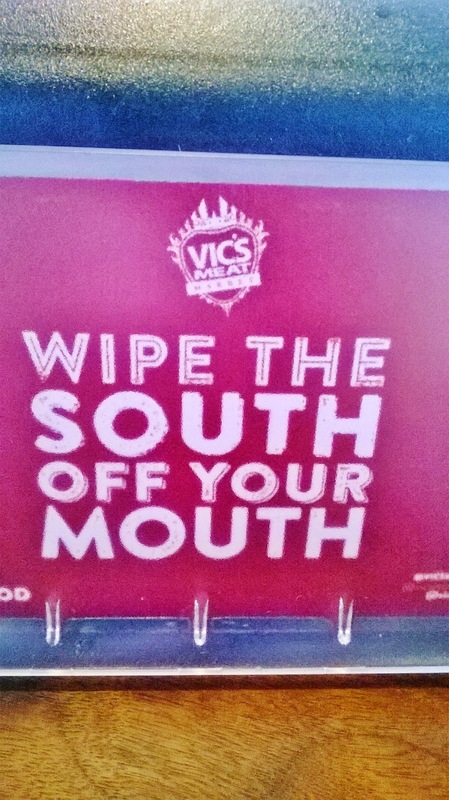 I think chips and burgers make the perfect partnership but the focus is all on the meat at Vic's meat market. I'd recommend the chicken wings. All the burgers are absolutely amazing and an absolute recommend was the Pulled Pork Sandwich ($10, above). The meat was juicy and full of BBQ smokey flavours. 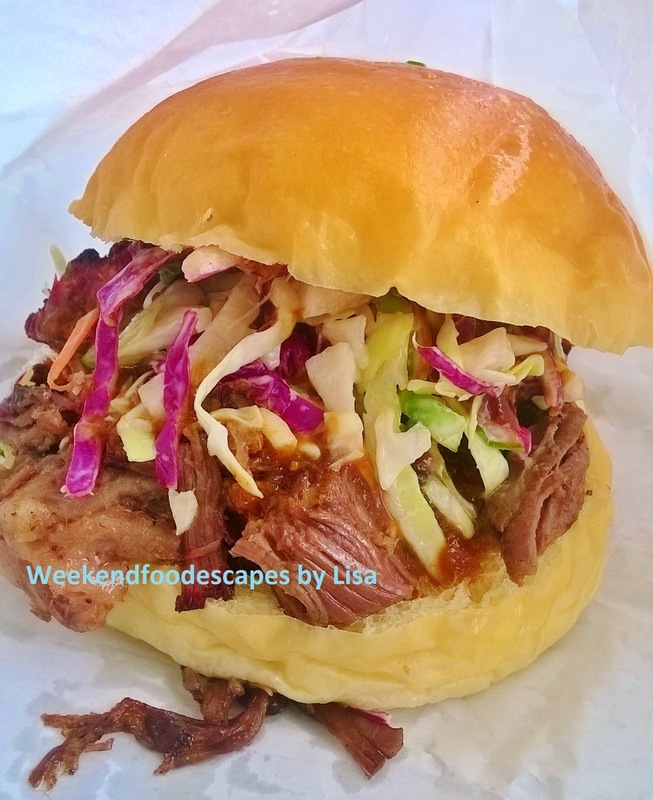 The bun is soft soaks in all those BBQ smokey flavours. The burger has the potential to get messy with lots of bits falling out but you won't be able to resist picking up those fallen juicy bits of meat so you can savour every last mouthful of deliciousness. I also tried the wagyu beef burger (below, $10) with cheese and tomato sauce and gherkin. I like the burger but prefer the pulled pork burger. 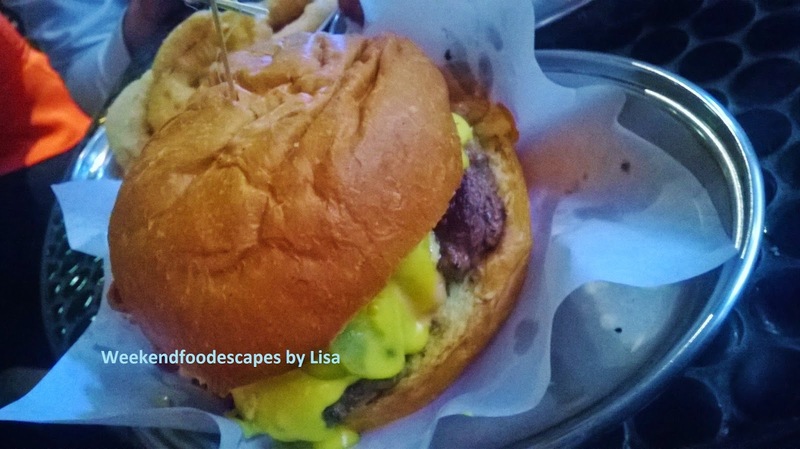 My eating partner absolutely adored this burger and preferred this burger. I would suggest trying all the burgers if possible. 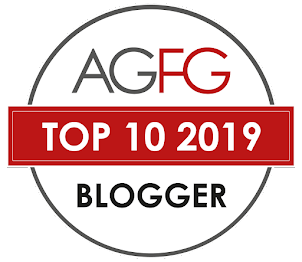 Thanks to my food blogging friend Annie who first blogged about this great place. It made me so very hungry when I saw her pics. My absolute favourite burger was the beef brisket burger (below, $10) which was just heavenly perfection. 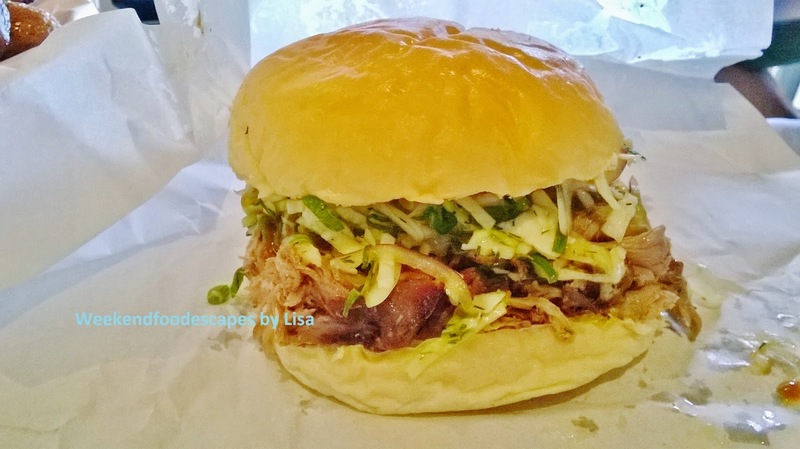 The flavours were again BBQ smokey but the coleslaw was a bit more chunky and to my liking. This is a must order dish. I have to come back to try the ribs. They will set you back more than the average $10 burger. It will cost you $25 for half a rack of ribs. I bet they will be absolutely worth it! Get there early to avoid disappointment. The ribs were sold out when I got there at noon.